Andong, the spiritual capital of Korea, is famous for many of its local specialties, from soju, jjimdak (braised chicken dish with vegetables and noodles), sikhye (rice dessert drink), and salted mackerel. Salted mackerel, called gangodeungeo, has enjoyed enduring popularity throughout the years, and is enjoyed as a snack, side-dish, and for mackerel enthusiasts, even a full meal. Historically, since Andong was located far from the sea, salting fish was necessary to preserve fish for as long as possible. Now, though fish is readily available, salting fish remains one of the most popular methods. 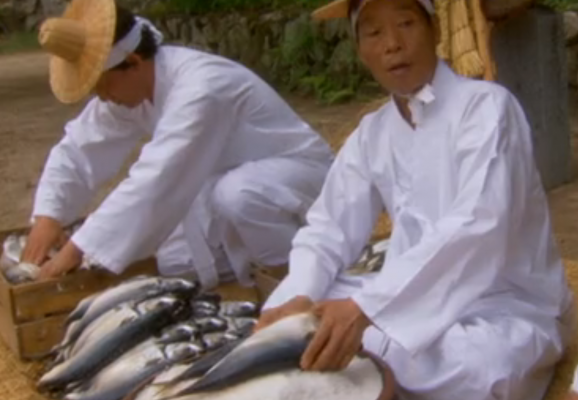 Andong mackerel is served in a variety of different ways, from pan-fried, steamed, and roasted. People love it for its flavorful and unique taste. However, it’s not for those of the faint of palates. Heavy on the salt, it’s best eaten with copious amounts of rice.